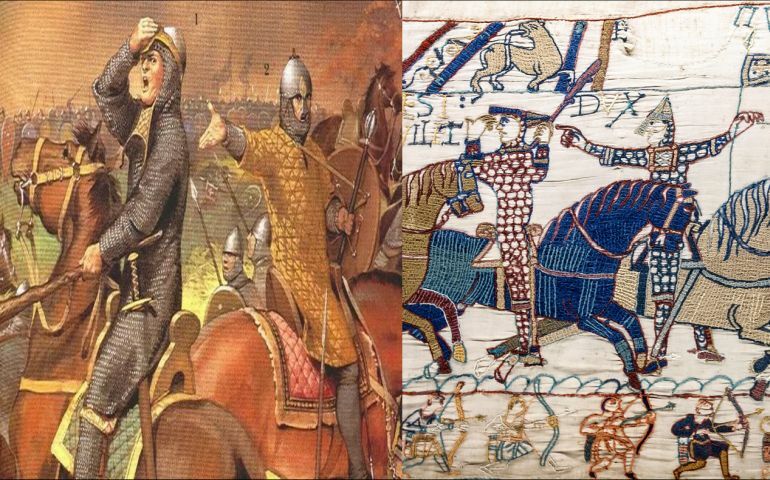 While the Bayeux Tapestry (or Tapete Baiocense in Latin) holds strong in British popular consciousness for its portrayal of the events leading up to the decisive Battle of Hastings, it should be noted that the embroidery in itself pertains to a magnificent piece of art impressive in both its detail and scale. In allusion to the latter, the Bayeux Tapestry is almost 230 ft long, and as such comprises a total of fifty to seventy-five scenes with Latin inscriptions (tituli). These ‘segments’ glimpse into the incredible historical scope that set the stage for the Norman conquest of England, circa 1066 AD. To that end, the still missing end of the textile probably culminated in the portrayal of the coronation of William I as King of England. And given the incredible length of the artwork, it is YouTuber extraordinaire Lindybeige who takes charge of explaining the Bayeux Tapestry in its entirety, with his usual servings of dollops of dry humor. 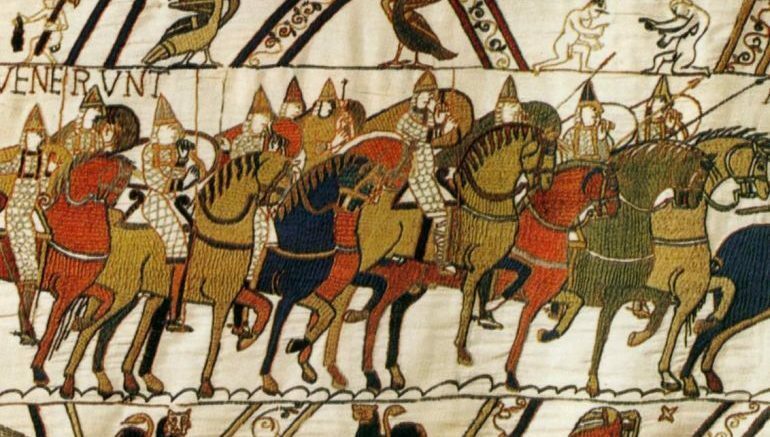 Historically, the Bayeux Tapestry was probably made in Canterbury, circa 1070 AD – that is four years after the conclusion of the Battle of Hastings. And while medieval French legends mention how the decoration was commissioned by Queen Matilda, who was William the Conqueror’s wife, certain key pieces of evidence suggest that the artwork’s patron was probably Bishop Odo, William’s half-brother. One of these crucial clues relates to the origin place of the Bayeux Tapestry itself, the Bayeux Cathedral in Normandy, built by Odo. Now interestingly enough, in spite of the tapestry’s favorable depiction of the Normans (which shouldn’t come as a surprise, since it was commissioned by the victors after their successful invasion of England), the decoration was probably (mostly) designed by native Anglo-Saxon artists. One of the reasons behind this hypothesis relates to the high quality of the needlework on the specimen that bears the trademark of Anglo-Saxon embroiderers. To that end, Anglo-Saxon artists were quite famous throughout Europe for their needlework during the contemporary period. Furthermore, the inserted Latin text also contains hints of the Anglo-Saxon linguistic scope, while many of depicted scenes are reminiscent of the stylistic influences found in the manuscripts illuminated at Canterbury. Coming to the design scope of the Bayeux Tapestry, it is probably not a tapestry at all. By definition, a tapestry is conventionally woven on a vertical loom; while the Bayeux Tapestry is embroidered in crewel (wool yarn) on a 224 ft long (and 1.6 ft wide) tabby-woven linen stretch. Now it should be noted that this entire linen stretch (or field) is not singular in its scope, but rather comprises nine separate panels that were sewn together and the joints were then expertly ‘hidden’ with further embroidery. So in essence, the Bayeux Tapestry is an impressive medieval specimen of embroidery, as opposed to a traditional tapestry. Duke William showing his face. Illustration by Angus Mcbride for Osprey Publishing on the left side, and the Bayeux Tapestry depiction of the scene on the right. In the actual Battle of Hastings, the left wing of the Normans – mainly comprising the Bretons and auxiliaries, after being under pressure for nearly two hours, with injuries, fatalities, and fatigue, finally wavered. The anxious center affected by their flank also pulled back due to the combined effects of panic and self-preservation. And as if the chaotic scene was not adverse enough for the Normans, a rumor began to spread that their Duke was killed in the battle. Consequently, the Anglo-Saxon right-wing pushed forth and began to pursue the routing Bretons, while even managing to catch up with some of the enemy horsemen who were left floundering in the marshy grounds. However, as with many of the pivotal encounters recorded in the annals of history, it was ironically this chaotic scene that offered Duke William the opportunity to strike back at his foes. But first he had to prove his own existence in front of his troops – a job done with aplomb when William rode through the ranks of the invasion force with his helmet pushed-back. 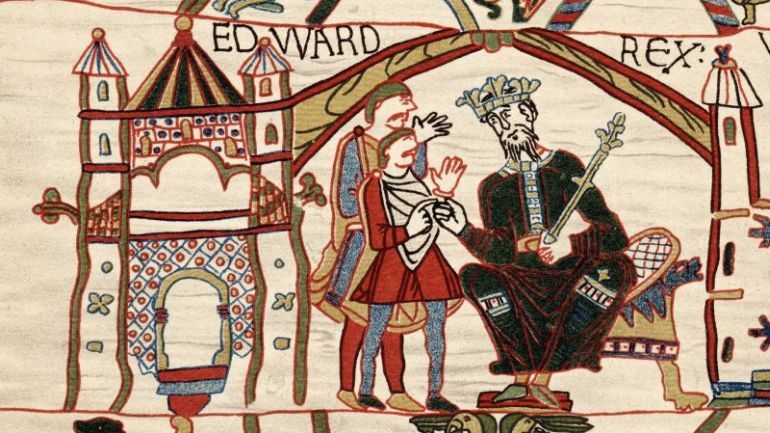 According to the Bayeux Tapestry, Count Eustace of Boulogne (also known as Eustace aux Gernons) helped the Duke in his ‘resurrection’ efforts by pointing towards him with a papal banner. And meanwhile William roared about the desperate Norman position with the inescapable sea to their back, and thus rather made a grandiose presentation of himself – which would have surely raised the morale of many of the proximate Norman troops. The final titulus of the Bayeux Tapestry bearing the label Et fuga verterunt Angli (“and the English left fleeing”) was probably added in early 19th century, during the height of anti-English sentiment in Napoleonic France. 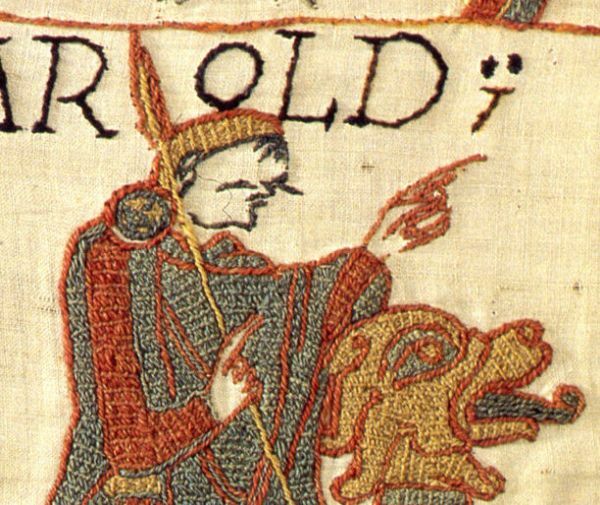 However, the penultimate titulus, labeled as Hic Harold Rex Interfectus (“Here King Harold is slain”), still retains its fair share of mystery with the depiction of the English king being struck in his eye with an arrow. Now if we analyze the scene from the actual perspective of the Battle of Hastings, the last stages of the encounter did involve Norman archers shooting their volleys into the rear-ranks of Harold’s forces. One of those arrows may have struck him through his eye (or above his eye). 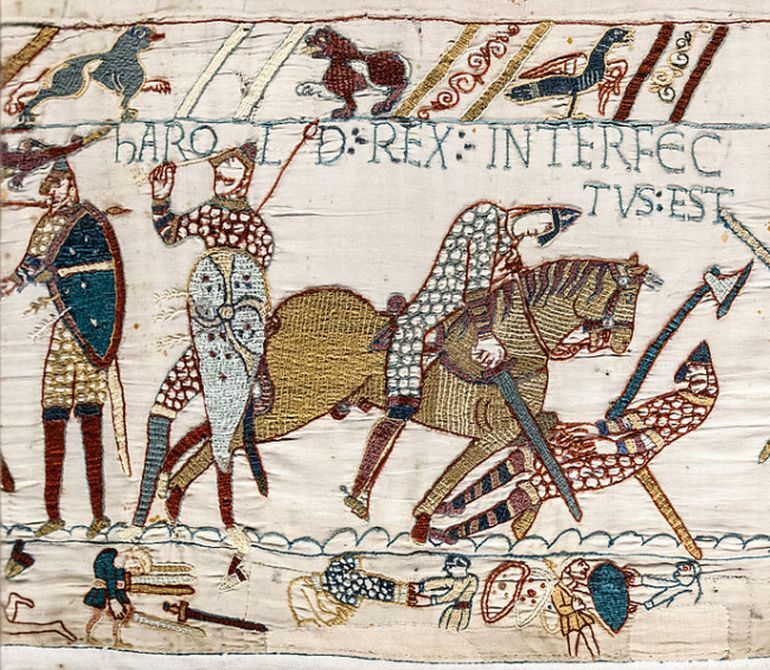 And while near-contemporary sources oddly remain rather vague on this momentous episode, the Tapestry depicts a Norman knight who injures the already prostate English king with his sword. Unfortunately, modern historians are still not sure of the exact cause of the English king’s death – with theories ranging from literal representations to symbolic depictions of blinding. On the puzzling side of affairs, this arrow was a later addition to the Bayeux Tapestry, possibly embroidered after the 18th century. And the needle holes along that particular segment suggest that there was an object that was depicted previously in place of the arrow. This has led to the recent conjecture that Harold was possibly ‘slain’ by a lance (instead of an arrow), and the next scene thus naturally progresses to him being further trampled by a knight with a sword.